Who wouldn’t want to be a fly on the wall on their child’s first day at school? The curious parents of one boy did, and they found a way to get a close-up view. Students in the United States recently returned to school after their summer holidays. 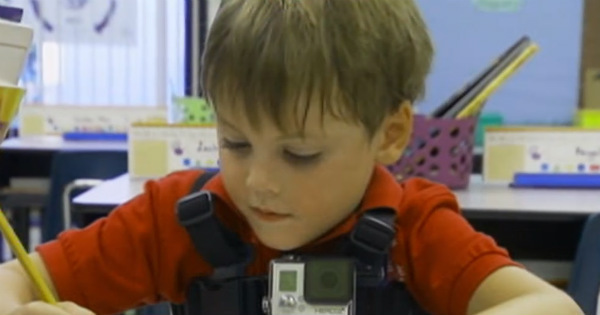 In Florida, parents May and Tim Weber wanted to get a true look at what day one was like for their first-grader son, Andrew – so they sent him to class wearing a GoPro camera. The footage it captured shows the six-year-old’s perspective as he walks down the corridor, gives his new teacher a hug and lays his eyes on his classroom and classmates for the first time. “I was impressed by what the perspective was of a three-foot something child,” Mr Weber tells ABC News. “How big everything was, the furniture, how big adults were, how big some of the other kids in school, and I think we sort of forget that perspective.” Ms Weber says she usually gets a “one-word answer” when she asks her children about their day at school. “Now I know maybe different kinds of questions to ask, about their friends,” she says. McFarlane Park Elementary School teachers are using the footage to better understand their students’ first-day experiences. See the video below – would you like to do this for your child’s first day?